Precisely 90 years ago, Le Corbusier debuted his groundbreaking Pavillon de L’Esprit Nouveau at the 1925 Paris Exposition des Arts Décoratifs, best known for Art Deco masters such as Émile-Jacques Ruhlmann. At the time, the architect’s cube-shaped housing unit distinguished by stark white walls and an open floor plan sparked considerable outrage. Now, in tribute to Corb’s visionary project, the Swiss Institute is staging ‘PAVILLON de l’Espirit Nouveau: a 21st century show home’, referencing his revolutionary approach through the eyes of more than 30 cutting-edge global architects and designers. 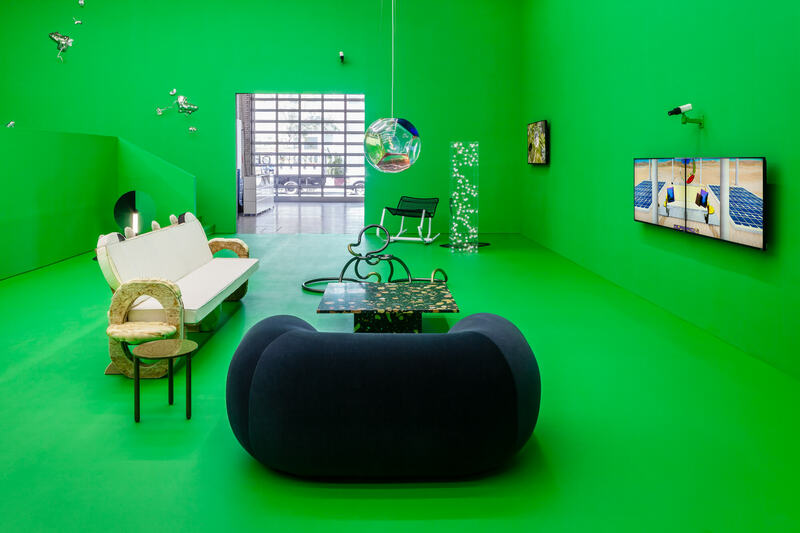 The show is curated by architect Felix Burrichter, the founder of Pin-Up magazine, who anchored the project within the Soho Swiss Institute’s stylish two-storey quarters, once the home of Jeffrey Deitch’s gallery. ‘I’ve created an environment that expands on Le Corbusier’s setting but rather speaks of our age with a pronounced emphasis on both escapism and surveillance,’ explains Burrichter. Architect Shawn Maximo designed the exhibition, bringing in 12 surveillance cameras that capture the gallery visitor walking through the show. They can even be found perching on actual pieces of design: from Max Lamb’s coffee table composed of marble scraps set in resin; to Piero Lissoni and Paul Kopkau’s Carbon Frog Chair; and Ifeanyi Oganwu’s sleek stainless steel shelving. ‘As to the design, all it was produced in the past 15 years,’ notes Burrichter who commissioned work by Josh Bitelli and Bethan Laura Wood. Other designers include Jasper Morrison and Joris Laarman, plus a host of new names. Yes, standard domestic spaces like the bedroom and kitchen fill the gallery but Maximo ramped up the stakes when he created a ‘Power Room’ complete with a climbing wall made up of Josh Bitelli’s silvery mirrored glass chunks. Swiss Institute director Simon Castets best sums up this creative endeavor. ‘As to totality, Felix’s creation is about stepping into the future while blurring the lines of reality and fantasy,’ he says. So if you’re hankering to take in an immersive experience with interiors and design of the moment, the Institute is place to go.